Summary: A 74-year-old man with a history of a chondroid lesion of the larynx noted an enlarging neck mass. Axial CT showed a large expansile lesion arising from the left thyroid cartilage. Multiple rings and arcs with relatively intact cortex indicated a chondroid lesion. Irregularity of the anterolateral margin abutted a prominent soft-tissue component. The specimen obtained from fine needle aspiration was suggestive of a malignant fibrous histiocytoma. After further resection, the final diagnosis was dedifferentiated chondrosarcoma. A new soft-tissue component or rapid growth of the mass can be indicative of a diagnosis of dedifferentiated chondrosarcoma. Chondrosarcomas are rare tumors accounting for less than 1% of all laryngeal tumors (1, 2). Unlike other head and neck chondrosarcomas, laryngeal chondrosarcomas are relatively low grade, both in clinical aggressiveness and histologic findings. Usually slowly growing, they can often be successfully controlled with local excision (1, 2). An extremely rare entity of dedifferentiated chondrosarcoma or chondrosarcoma with additional malignant mesenchymal component may be aggressive and rapidly fatal (3–5). We herein report the CT findings of a patient with a dedifferentiated chondrosarcoma, emphasizing its prominent soft-tissue component. A 74-year-old man presented with a slowly growing, firm mass measuring 5 cm in diameter over the left thyroid cartilage. He had a history of an incomplete resection of a low-grade chondrosarcoma of the left thyroid cartilage 9 years previously. Axial CT performed through the neck by using a spiral technique (collimation, 3 mm; table feed, 3 mm/s, reconstructed at every 1.5 mm) was performed with IV administered nonionic contrast material (370 Img/mL, 75 mL). An expansile lesion, measuring up to 4.5 cm, apparently arising from the posterior half of the left alar of the thyroid cartilage, was shown. Multiple rings and arcs and relatively intact cortex indicated a chondroid lesion. A large soft-tissue component extended anterolaterally, appearing to involve the strap muscles. The cortex was incomplete at the point at which the soft-tissue component contacted the more typical chondroid component. The lesion abutted the carotid artery but was apparently limited to the visceral compartment. The lesion displaced both false cord and true cord and narrowed the subglottic angle (Fig 1A–C). There was no evidence of lymphadenopathy. A, Soft-tissue window axial contrast-enhanced CT through thyroid cartilage shows expansile lesion from left alar of thyroid cartilage. Multiple rings, calcification arcs, and relatively intact cortex suggest chondroid lesion. False cord is significantly displaced. Note large soft-tissue component extending anterolaterally into strap muscles and incomplete cortex at point (arrows). B, Bone window of expansile lesion shown in panel A. C, Bone window axial CT scan obtained through vocal cord level shows mass representing typical chondroid lesion with multiple rings and calcification arcs (arrow) and well-preserved cortex at this level. D, Histologic section from laryngectomy specimen shows features of dedifferentiated chondrosarcoma. Area of low-grade chondrosarcoma is on left, juxtaposed to malignant fibrous histiocytoma-like area of high-grade sarcoma on right (H&E, original magnification ×125). The patient underwent fine needle aspiration of the soft-tissue component of the lesion. The specimen obtained showed highly cellular aggregates of markedly pleomorphic, mitotically active, spindle, and giant cells. There was no evidence of a background cartilaginous matrix or necrosis. These findings were consistent with a high-grade sarcoma, and the presence of a storiform growth pattern suggested a malignant fibrous histiocytoma. The cells exhibited features of a fibrosarcoma or malignant fibrous histiocytoma by electron microscopy. 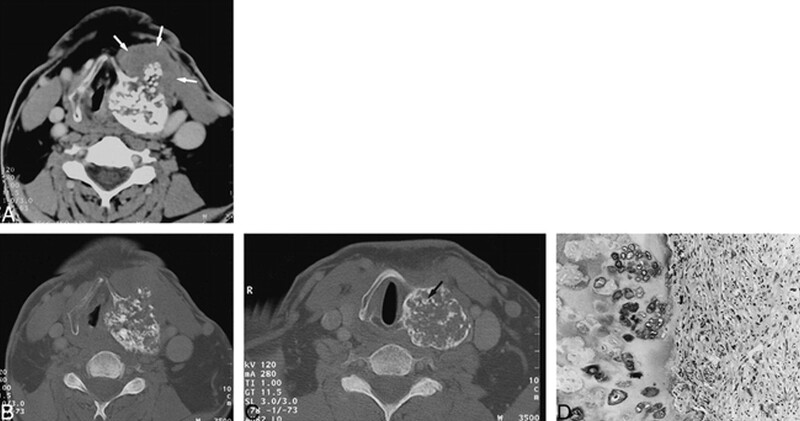 A review of the patient's known low-grade chondrosarcoma of the larynx revealed a neoplasm composed of relatively uniform cells, embedded within abundant cartilaginous matrix. The morphologic characteristics were distinctly different from that of the current lesion. Considering these findings and the 9-year interval since the patient's original diagnosis, it was likely that the current lesion represented a dedifferentiated chondrosarcoma. The patient underwent a total laryngectomy. A histopathologic examination revealed that the malignant neoplasm was composed both of a low-grade chondrosarcoma, hyaline type, grade 1–2/3 juxtaposed to a high-grade spindle cell sarcoma, grade 2–2/3 (Fig 1D). The morphologic features of the high-grade soft-tissue component included a cellular, predominantly storiform growth pattern of markedly pleomorphic spindle cells with vesicular nuclei and one or more nucleoli. Occasional tumor giant cells were present along with numerous mitoses, some of which were atypical. The soft-tissue tumor contrasted sharply with adjacent areas of low-grade chondrosarcoma having a typical chondroid matrix with amitotic chondrocytes in lacunae. Immunohistochemical studies showed that the malignant spindle cells were strongly positive for vimentin, focally positive for alpha 1-anti-chymotrypsin, and predominantly negative for cytokeratins, S-100, desmin, and muscle-specific actin. Taken together, the histologic and immunohistochemical findings were diagnostic of a dedifferentiated chondrosarcoma with malignant fibrous histiocytoma as the predominant soft-tissue component. Chondrosarcomas are rare tumors accounting for less than 1% of all laryngeal tumors (1, 2). Chondrosarcomas usually occur in the 4th to 6th decades of life and have a reported male-to-female predominance ranging from 5:1 to as high as 10:1 (2, 6). Laryngeal chondrosarcomas typically originate in hyaline cartilage. Approximately 70% of cases arise from the cricoid cartilage. The thyroid cartilage is the next most common site of origin (7). The symptoms of chondrosarcoma depend on the location of the mass. Endolaryngeal and subglottic growth causes dyspnea as the airway is progressively narrowed, whereas extralaryngeal growth, originating in the posterior cricoid, can produce dysphagia. Limited laryngeal mobility causes hoarseness. Tumors involving the thyroid cartilage are likely to produce a painless neck mass (8). CT is an excellent technique for delineating the tumor with respect to origin and extent within the laryngeal skeleton. Coarse or stippled calcification within the tumor is the most helpful CT finding (8). Decisions regarding the type and feasibility of conservative surgery are helped by CT (8, 9). MR imaging can also show the lesion within the larynx and has the potential advantage of superior contrast resolution of the tumor and contiguous tissues and the capability of the imaging in multiple planes (9). Unlike other head and neck chondrosarcomas, laryngeal chondrosarcoma is relatively low-grade, both in clinical aggressiveness and histologic findings (1, 2). Usually, they are slowly growing and can often be successfully controlled with local excision (1, 2, 8). Rarely, however, an additional aggressive and rapidly fatal malignant mesenchymal component may develop within the lesion (10). The term dedifferentiated chondrosarcoma was first introduced by Dahlin and Beabout (3) in 1971. They reported 33 cases of well-differentiated chondrosarcoma of bone with additional malignant mesenchymal components, such as fibrosarcoma or osteosarcoma. Some authors prefer instead to use the term chondrosarcoma with additional malignant mesenchymal component because of the morphogenesis of the tumor. This dedifferentiated tumor represents 6% to 10% (3, 5, 11) of all chondrosarcomas and frequently involves the extremities, especially the proximal femur and the pelvic bone. In contrast to the expected 5-year survival rate of more than 70% for patients with low-grade chondrosarcomas, the prognosis for this tumor is extremely poor; the average survival time has been reported as only 6 months (10) and the 5-year survival rate as 10.5% (12). Approximately 70% of the patients manifest a pulmonary metastasis during their clinical course (11). The poor prognosis associated with this type of tumor is attributed to the presence of the additional malignant component that arises from the pre-existing, well-differentiated cartilaginous tumor (10, 12). Histologic examination of dedifferentiated chondrosarcoma characteristically shows the presence of a well-differentiated chondrosarcoma juxtaposed to an anaplastic, non-chondroid sarcoma. The differentiated portion of the tumor consists most often of malignant fibrous histiocytoma, as in this case, or fibrosarcoma. Less commonly, however, osteosarcomatous or rhabdomyosarcomatous elements may also be present (10, 12). The high-grade soft-tissue portions of the sarcoma usually comprise a larger volume of the tumor than the well-differentiated chondrosarcomatous areas (10, 12). The imaging features of a dedifferentiated chondrosarcoma are very similar to those of a well-differentiated chondrosarcoma and even to those of a benign chondroma. It may be impossible to differentiate them based on imaging alone. Rapid growth of the mass or prominence of the soft-tissue component may suggest fibrosarcoma or malignant fibrous histiocytoma-like change and can be indicative of dedifferentiated chondrosarcoma. In summary, it may be impossible to distinguish a dedifferentiated chondrosarcoma from a well-differentiated chondrosarcoma or even a benign chondroma based on imaging alone. Radiologists, however, should be aware that its aggressiveness, both clinically and histologically, as well as the presence of a new soft-tissue component or rapid growth, can be indicative of a diagnosis of dedifferentiated chondrosarcoma. ↵1 Address reprint requests to Hugh D. Curtin, MD, 243 Charles Street, Boston, MA 02114.